The High Mowing Seeds giveaway is over and the seeds are on their way to the winner; but let's have another giveaway! 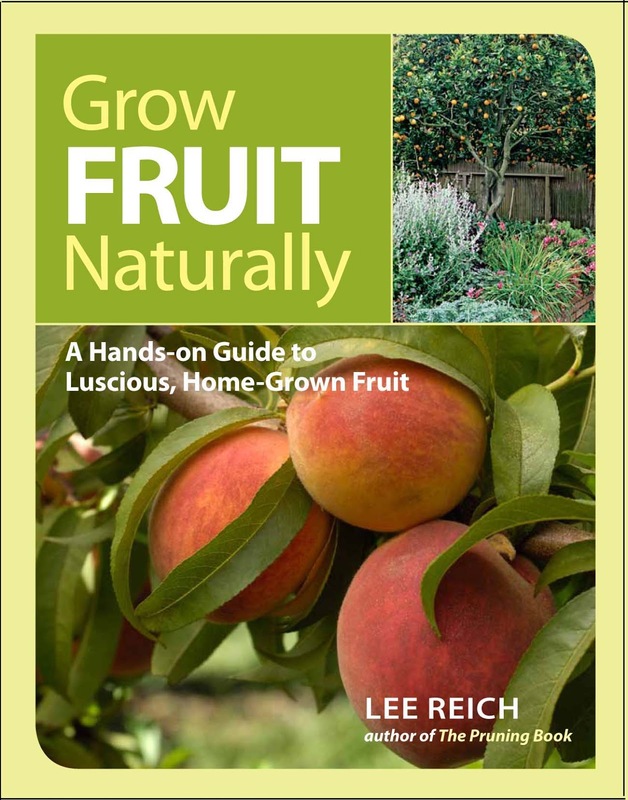 This time it's a copy of my newest book, Grow Fruit Naturally. 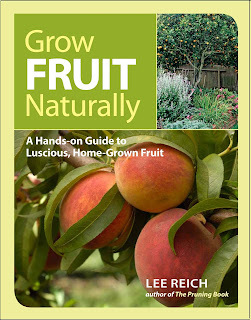 I'll select randomly from all the comments offered by everyone who writes in as to what state they live in and what fruits they grow successfully and unsuccessfully, and what their favorite fruits are. The deadline for getting comments in will be Wednesday, April 3rd, at noon. Philadelphia should not be called the “city of brotherly love.” No, I didn’t get mugged on a recent trip there. It’s just that more evident -- to me, at least -- is Philadelphia’s greenery. The city is oozing greenery, with over 10,000 acres of park land and hundreds of community gardens and small orchards right within city limits. 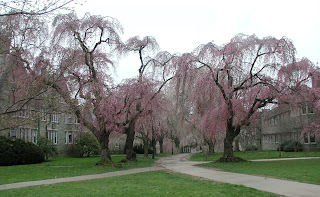 But let’s get back to today’s city of horticultural love (Philahortica?). Trees seem to like it there. 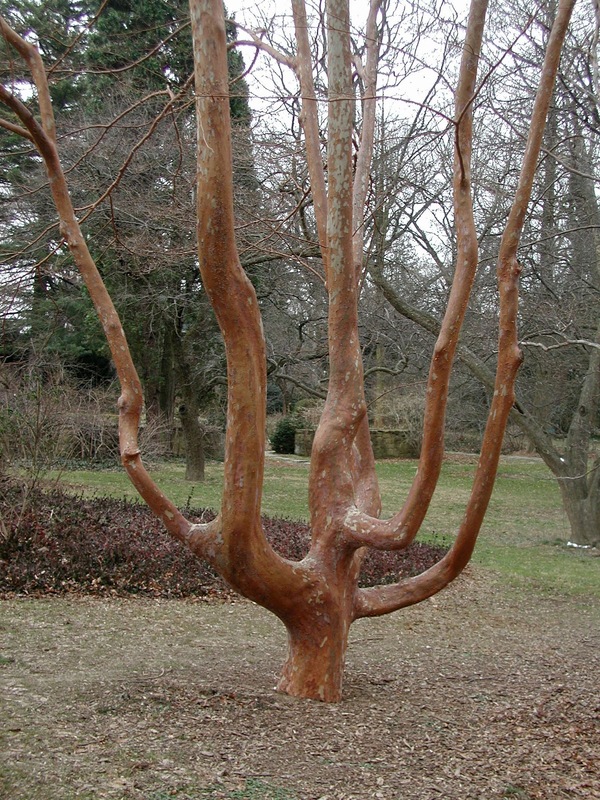 I’ve come upon majestic specimens of sycamores and weeping cherries, Korean mountain ash from which drooped fiery, orange fruits, and stewartia trees with sculptural, copper-red trunks. Last week, the weather there was warm yet the ground seemed to be covered with broad, thin expanses of lingering snow. No, not snow! Closer inspection revealed sweeps of pale blue crocus flowers just unfolding. This self-seeding, deer-resistant crocus species -- Crocus tommasinianus, with the appropriate common name of snow crocus -- seemed to be coming up everywhere. 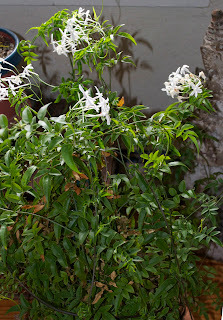 Already I’ve sited, in my mind, a home here for Sarcococca. This evergreen plant enjoys partial shade with moist, well-drained soils that are rich in organic matter, which are the same conditions enjoyed by many plants in the heath family (Ericaceae). 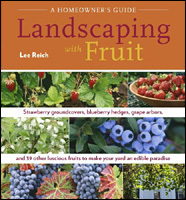 I have a whole bed of heath family plants -- including mountain laurel, rhododendron, lowbush blueberry, and lingonberry -- along the east and north sides of my home. Sarcococca will look right at home sharing the bed with these plants when tucked right up to the brick wall of my house. And now for the giveaway: A "High Mowing" cap and their boxed set of seeds for heirloom vegetable lovers. The box includes packets from such old-time favorites as Brandywine tomato, Red Salad Bowl lettuce, Detroit Dark Red Beet, Red Russian Kale, and others. 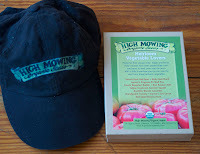 To enter this giveaway, in the "Comments" box below tell us about some of your favorite heirloom vegetables. Winner of both the hat and the box of seeds will be selected randomly and contacted for mailing by email. The nice thing about having this schedule is that the weather no longer pushes me around. 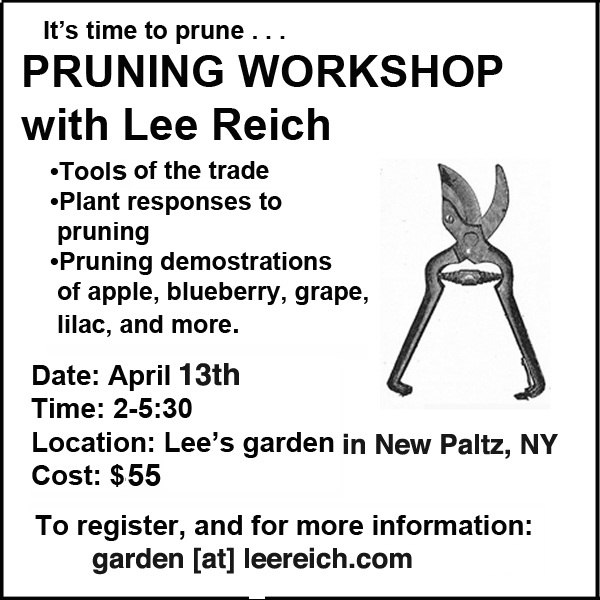 A warm, sunny day in the middle of April might tempt me to plant corn -- except if I look at my schedule. The year before last, the last spring frost was in early April, so corn could, in fact, have been planted earlier. 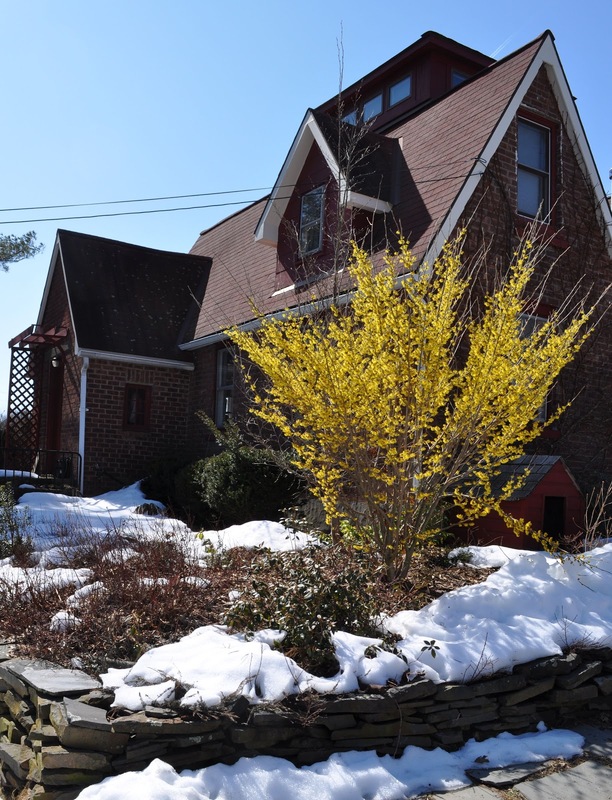 Last year provided greater temptation with a spate of 70 degree temperatures in March. The mercury plummeted in mid-May, which would have snuffed out the corn sprouts. 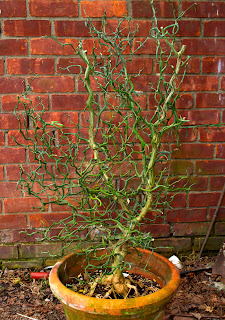 So the plant gets pinched, and gets to live -- for at least another year. I’ve surely paid my dues in the “experiment” department. I’ve grown garden huckleberries, an annual that, cooked with lemon and sugar, is alleged to rival blueberries for pie. False! Garden huckleberries are tasteless. The pie would taste like a lemon-and-sugar pie. I’ve grown white tomatoes, touted as being sweeter than red tomatoes. One taste made me realize how welcome is the refreshing tang of red tomatoes. And then there was celtuce, supposedly combining the leafy qualities of lettuce and crunchy stalk of celery in one plant. Not so! It tasted like bad celery and bad lettuce. Celtuce is essentially a lettuce going to seed, the seedstalk trying to stand-in for celery. 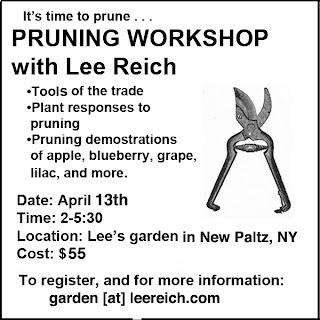 Okay, now that I think about it, I am growing some things that are sort of new this year. 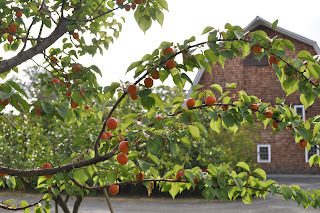 Normally I would shy away from planting apricots, even though biting into a tree-ripened apricot -- sweet, soft, and rich in flavor -- is a heavenly experience. But apricot trees have serious insect and disease problems, their early blossoms usually succumb to late spring frost, and our fluctuating winter temperatures increase disease susceptibility so that the trees die either quickly or slowly. Apricots, in my future -- I hope. Another “new” plant for this year is honeyberry (Lonicera edulis), sometimes called edible blue honeysuckle. 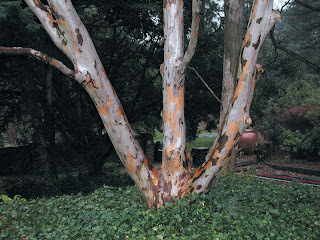 This is another plant I grew many years ago. It performed poorly because of the poor care I gave it which was mostly because of the poor flavor of the one berry I tasted. But honeyberry is a new fruit, in the same place, development-wise, as the apple might have been 2,000 years ago. New varieties have come down the pike and I’m ready to try these newbies. New citrus will expand my current collection. I’m deciding between Satsuma mandarin and Clementine which, in either case. 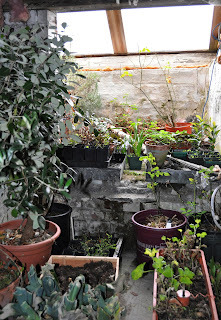 will join the rest of the (citrus) family in pots here that winter indoors in sunny windows and summer outdoors in full sun. I’ve gardened for decades, but with a mere 12 years of greenhouse growing under my belt, feel like a novice trying to keep the greenhouse green and productive all winter. 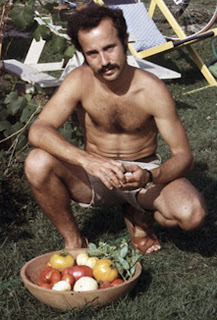 The basic routine is to sow salad and cooking greens in late summer and autumn for late autumn, winter, and early spring harvest. Timing is key. Planted too early, some greens go to seed before winter even gets underway; planted too late, short days and cool temperatures don’t allow enough growth for reasonable harvest. •Direct sown Rhapsody and other lettuces; Aug. 28th. Lettuce sown in seed flats at the end of December and transplanted out in the greenhouse in mid-February is now big enough to contribute some leaves to salads and, in a few weeks, whole heads. 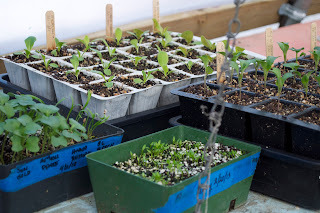 I’ll round out those pickings with recent sowings of spinach, arugula, erba stella, and mustard greens in the greenhouse. More record-keeping along with fine-tuning sowing times and what varieties to grow will make the greenhouse even more productive in years to come. 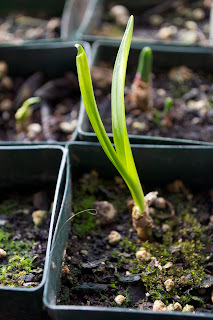 As would be happening in parts of the Mediterranean, some of the plants in my basement feel spring in the air and are starting to grow; the most exciting of the plants down there are some ramps that I was gifted last spring and potted up. Ramps, sometimes called wild leeks, are a kind of wild onion much in demand in spring. They’re one of the first greens of spring, enthusiastically welcomed in with ramps festivals in some parts of the country. I too became enthusiastic about ramps after tasting them last spring so, of course, I decided to try to grow them -- no easy proposition. 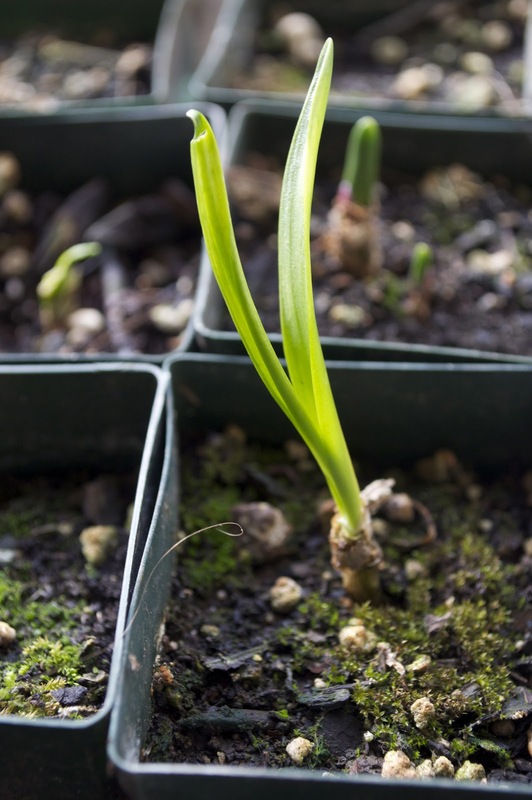 Ramps grow wild on the leafy floor of hardwood forests, their green leaves appearing early in the season and for only a few weeks to feed the bulbs, after which they die back to the ground and flower stalks appear. Little is known about growing them. My ramp bulbs have sprouted! Last week I wrote about onions and their sensitivity to photoperiod; long days make northern-types stop growing leaves and channel their energy into fattening up bulbs. The more leaves plants have before the critical photoperiod that triggers that changeover, the bigger the bulbs. Methinks: Why not apply the theory to growing ramps? By starting early, the bulbs have more time for leaf growth before whatever critical photoperiod brings it to a screeching stop. 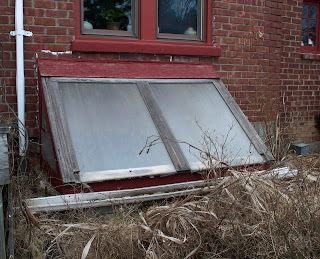 The bulbs also enjoy cool conditions, which should endure in the basement window for weeks and weeks. If my reasoning is sound, I could get even better growth by looking to more northerly locales for ramp bulbs or seeds for planting. Because ramps originating in those parts would have to begin growth later in spring, they might need to experience even longer days before leaf growth stops. Down here, then, they’d get extra growing time before those longer days arrested leaf growth. 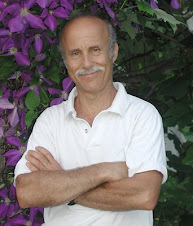 In fact, it is short nights rather than long days that trigger that halt in leaf growth. Under natural conditions, short days and long nights go hand in hand. 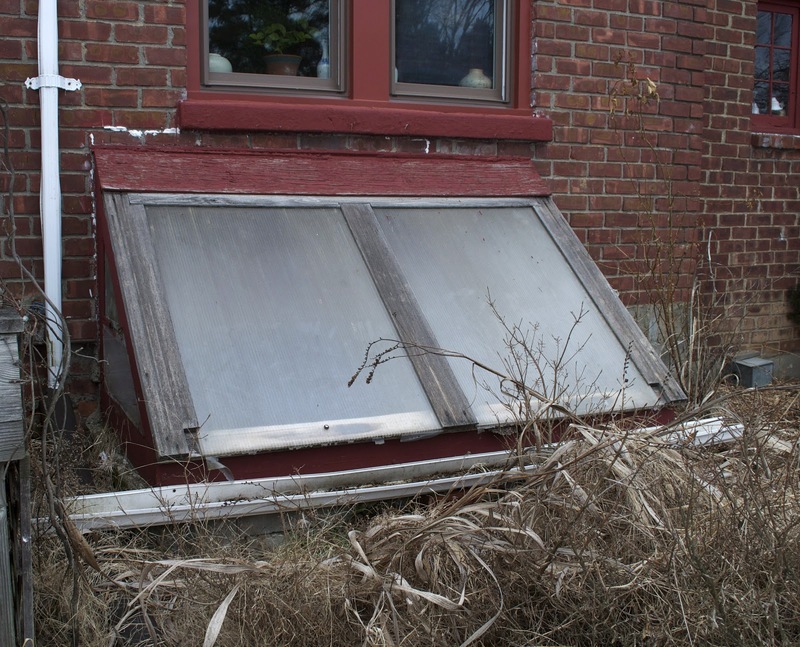 I could change that by throwing a light-blocking blanket over the plants for a couple of hours at the beginning or end of the lengthening days, tricking the plants into thinking the days are still short enough to keep growing leaves. I need to build up a stock of ramps, by bulb or by seed, to get enough plants to fool around with. Ramp seeds or bulbs are available mail order from http://www.rampfarm.com. Sitting, waiting in darker areas of my basement away from the light are fig, pomegranate, mulberry, and che plants, also enjoying the Mediterranean winter. These plants lose their leaves for winter, and light generally isn’t needed by leafless, dormant plants. In contrast to my hopes for the ramps, I’m hoping for a late spring for these plants. 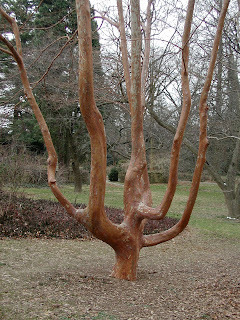 If fig and company get wind of spring in the air, their buds are apt to start swelling and then growing into new shoots. 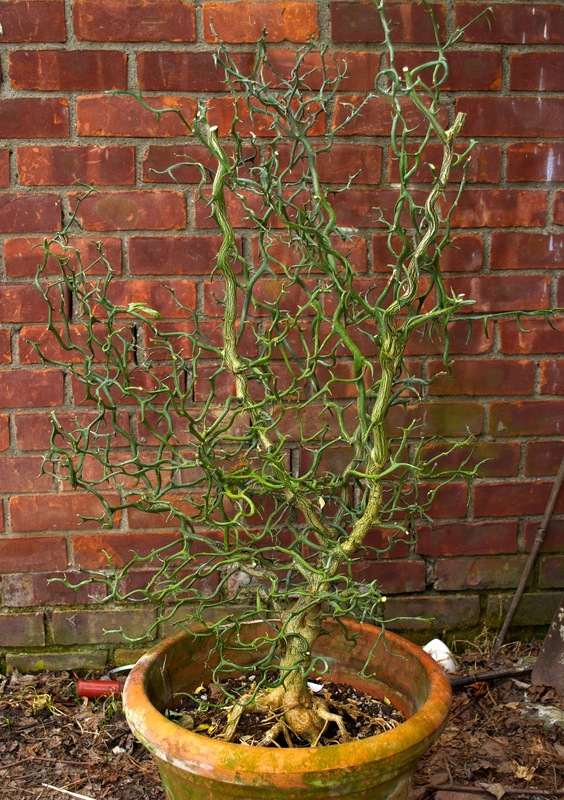 Which gives rise to two problems: First, that the plants then need light; and second, that the relatively wan indoor light leads to overly succulent shoots that will “burn” once plants are moved outdoors when the weather reliably warms. Most of these plants are in large pots and there just isn’t enough space in the Bilco opening for all them, even if light there was sufficient, which it isn’t. My tack with these large, potted plants is to hold back growth as long as possible by keeping them on the dry side. And then, when outdoor temperatures warm up just a bit -- with lows in the mid twenties -- I’ll move them outside to, I hope, begin growth in synch with our spring temperatures. Of course, I can only do that if the plants have remained dormant when I move them out. 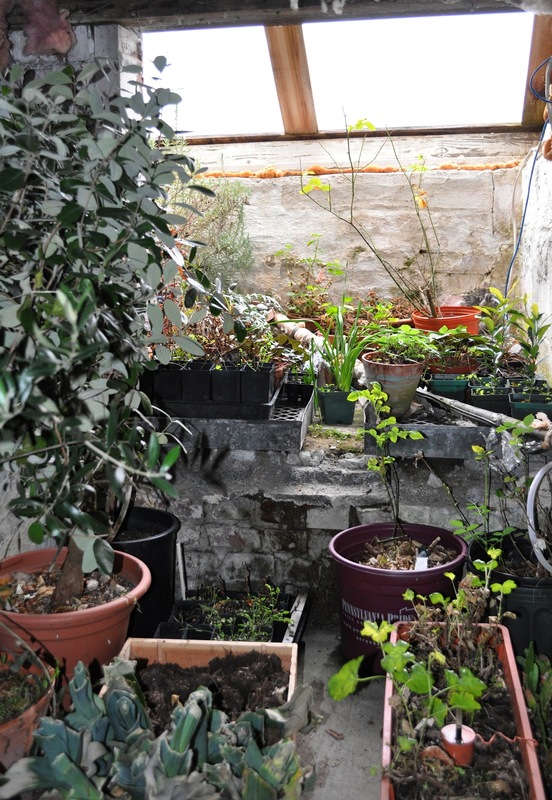 And if temperatures plummet one or more nights, I’ll have to lug all the plants into the garage, keeping exposure to cold commensurate with growth stage of the plants.